This BBC documentary you're going to see today is probably one of the best "making-of" ever done for a Disney theme park attraction - if not THE best. "Shoot for the Moon" was filmed in 1994-1995 during the building of the Disneyland Paris version of Space Mountain. Tim Delaney, show producer of the land appears in person, with many others WDI imagineers. Those of you who already know it will be pleased to see it again, but, for those of you who have never seen it, i strongly recommand you to take the time to watch it, because it's reaaaally a perfect documentary! 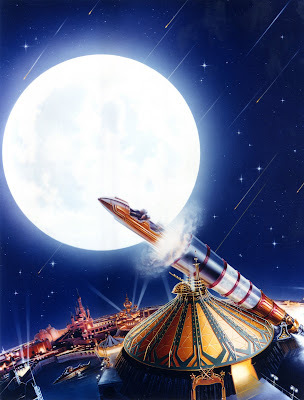 Also, the moie is about the FIRST story line of the attraction, the one inspired by Jules Verne "From the Earth to the Moon", which is now unfortunately extinct, as it has been replaced by the "Mission 2". And, although the new version have some interesting special effects, i'm sorry to say that the first version was better - and had a better music, too. Okay, enough talk, here is the real thing, the "Shoot for the Moon" documentary. And, believe me, it's a real good shoot! In addition to this fantastic video, i have re-post below a previous article with many great renderings and making-of pictures of DLP Space Mountain. Don't miss it!